When you want high quality furniture for your home, the only Ohio Amish furniture store you need to visit is Amish Originals Furniture Co. in Westerville. Here you will find everything you need to furnish your entire home, as well as a variety of accessories and other items that will finish off any room perfectly. The Amish take a lot of pride in their craftsmanship, and it shows in the products we carry in our stores. The furniture we sell is built to last, and the styles will fit in with any type of décor, so it will still be popular with future generations who you pass it down to. You have many options when it comes to furniture stores, but this Ohio Amish furniture store offers things that you will never get from any department or big box store. For instance, the items you will buy at other stores are usually made on an assembly line. This means that there are thousands of other people with the same furniture in their homes, and that you end up with furniture that is not always well-made. Quality Service – When you buy items from department stores, you are dealing with their clerks who often drift from department to department and don’t really know a whole lot about the items they are selling. Our sales associates are experienced and knowledgeable, and can help you choose the best items for every room in your home. We want all of our customers to leave our Ohio Amish furniture store happy and knowing that they made the right purchases. Delivery Available – At most department stores, once the sale is completed, you are on your own. This includes figuring out a way to get your purchases home. For an additional charge, you can have all of the items you buy from us delivered right to your door. You won’t have to wait around forever on delivery day either, because we give you a two hour window, and the drivers also call ahead to let you know they’re on their way. You also have the option to pick up your purchases and avoid the delivery fee. Great Selection – At our Ohio Amish furniture store you will find a huge selection of items for every room in your home. Choose from sofas and chairs, dining and kitchen table sets, beds, children’s furniture and a whole lot more. We even have everything you need to accessorize each room, including wall shelves, mirrors and other items. The next time you need to buy new furniture for your home or office, visit the Ohio Amish furniture store that offers quality handcrafted furniture at affordable prices. 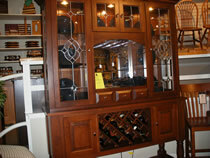 Drop into the showroom today and check out the terrific furniture available.